Does a foreigner have a chance to take part in a tea ceremony in Japan? When I was going to Japan for the first time, I was convinced that it would be almost impossible to be granted the honor of attending a traditional tea ceremony if you don’t know the Japanese people. And by “Japanese people” I mean Japanese who have contact with traditional Japanese arts. I was not completely wrong. I still think that in order to take part in a very formal tea ceremony held in a prestigious tea pavilion and run by an outstanding tea master, you must actually have friends who will trust you enough to invite you to such a meeting. 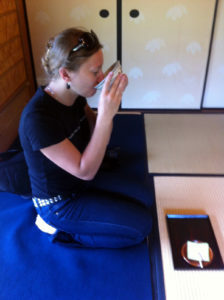 In general, this also involves the need to know the Japanese etiquette, including the tea etiquette. It is worth mentioning that many Japanese live their lives never taking part in a formal (or other) tea ceremony. However, taking into account that Japan is increasingly opening to the world and revealing its unique culture, it is possible to watch official tea-making demonstrations. Actually, there are more and more occasions for a stranger (gaijin) or person unfamiliar with a tea etiquette, to take part in an informal tea ceremony. Of course the informal tea meetings are simplified ceremonies, often significantly shortened. And the guests are usually guided through them step by step. But even such a shortened ceremony is a very interesting experience. This is one of those experiences that let you understand how important to Japanese people is “the form”. The Kōko-en garden is exceptionally beautiful. The walk through the garden really helped to calm down before the ceremony. (Especially after the visit in the castle in the company of crowds.) I remember walking with my fiancé through the ponds on flat stones, contemplating the beautiful views. Sōjuan tea pavilion was extremely spacious. We were led to the room, where tea was served, by a corridor running partly around the building. The corridor was placed at the very outer walls in which the huge windows and shōji doors were set. The windows and doors were open due to the hot afternoon. 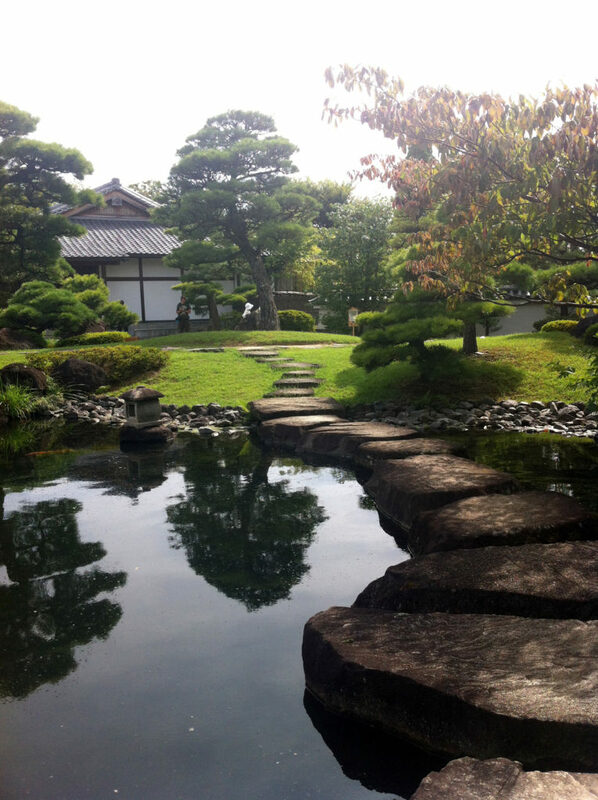 We looked through them and once again we could enjoy the views of the Japanese garden. Before the start of tea ceremony, we were instructed what to do. We learned where to sit on tatami mats, how to hold a ceramic cup in a hand, how to drink the tea and how to put the cup back. The master of the tea ceremony was a man who conducted a conversation with the guests. It was a bit of small talk. He asked people where they came from and, if they were not Japanese, whether they liked Japan. The conversation was conducted in Japanese, but in difficult moments we spoke English. The tea and Japanese traditional sweets (wagashi) were prepared and served by a woman. She was dressed in a beautiful, plain and modest kimono. 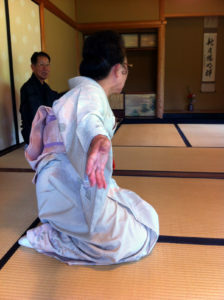 One must know that during the tea ceremony women-hosts are wearing a special kind of kimono. Now I know that it is common that during the informal tea meeting (chakai) only the first few cups of tea are prepared in front of the guests. (The shelf with tea utensils was in the corner, to the left of the tokonoma niche with a decorative calligraphy and floral composition of the chabana – literally “tea flowers”). Tea for other guests is prepared at the back, in so-called mizuya, and brought to guests from there. That was how the tea was served also in our case. Although this tea ceremony took place a few years ago, I found a short video from that time. Listen, how I try to explain how to handle a cup of tea (I speak in Polish but there are subtitles given). That time I did not have a lot of knowledge about the Japanese Way of Tea – sadō (sometimes called also chadō) My knowledge on this subject is still not great. I managed to find out a bit more by taking part in special workshop (the Urasenke Way of Tea) and reading some books and publications. (I recommend few books about sadō at the end of the article.) Anyway, I would like to explain the general Japanese tea ceremony course from the beginning to the very end. I would also like to recall some definitions and information about the tea and the utensils for its preparation. This basic knowledge will definitely help you to navigate the world of Japanese tea. Guests appear on the place ahead of time. (They should have make sure that the meeting would take place a day before.) They are welcomed by the host (master of the ceremony) at the gate. The guests are directed to the garden, where they walk and contemplate the beauty of the garden until the host prepares everything in the tea pavilion. In the meantime, they choose a guest of honor among themselves. Usually the guest of honor is the person most respected or best familiar with the tea etiquette, as he or she helps the host to lead the tea meeting. Finally, everyone sits on a special bench and wait for an invitation to get inside. Guests get inside one by one, first approaching the spring or stone bowl with water. They wash their hands and mouth and symbolically clean the spirit. Guests enter through a small entrance and stay on knees, which symbolizes the equality of all participants of the meeting. Everyone apologizes to the next person for getting in first. One cannot enter the pavilion wearing shoes or outerwear. The additional objects (formerly also weapons, including samurai swords) need to be left outside. Inside of the pavilion the guests are sitting on the tatami mats in the particular order. On the way to their place they stop in front of the tokonoma niche to admire the scroll with calligraphy and flowers of the chabana. The calligraphy text and flowers refer to the subject of the meeting and/or to the season of the year. One should bend slightly. When a host enters the room, the guest of honor, on behalf of everyone, gives thanks for the invitation and for the preparation of the ceremony. Then it is advisable to raise the subject of the tea pottery prepared for the meeting and the text on the scroll hanging in the tokonoma. Guests are treated with a light meal chaseki/chakaiseki – a special type of kaiseki multi-course meal. The food can be accompanied with alcohol and/or wagashi sweets. The host boils water for tea. After wiping with a special cloth, the ceramic tea cup is filled with a powdered green tea (3 teaspoons per portion), poured with hot water and mixed with a bamboo “brush”. 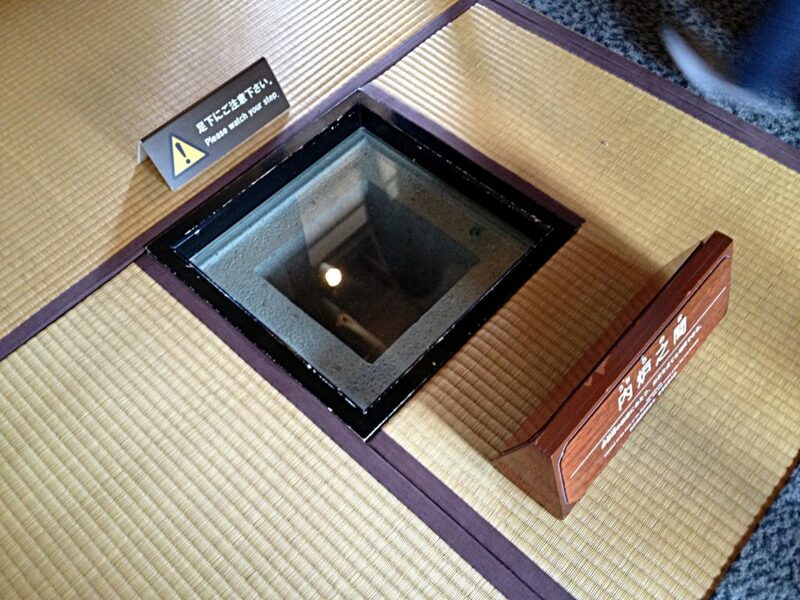 In case of dense koicha tea, the host prepares one cup, which then the guests pass on, drinking from it. In case of less dense usucha tea, the host prepares one cup per each person. The host prepares it one by one and subsequently puts it in front of the guests. Everyone, accepting tea, apologizes to the next person that he or she would drink first. When everyone drinks their tea, or ask for a “refill” (sometimes it is supposedly allowed) and drink it, the ceremony ends. At this point, the guest of honor again makes thanks for the preparation of the wonderful ceremony. Sadō (茶道) – literally “the way of tea” and cha-no-yu (茶の湯) – literally “hot water for tea” are two popular Japanese terms used to describe the broadly understood “art of tea” (the latter also applies to the ceremony itself). The history of tea in Japan starts in the end of 12th century, when the monk called Eisai brought from China first seeds of tea ans atarted the first tea farm on Kyushu istand. Eisaiis also the author of the first texts about tea, namely Kissa yōjōki (How to Stay Healthy by Drinking Tea) dated for 1211. One of the first tea rooms, the construction of which was officially recorded, was created in Ginkaku, the Silver Pavillon in Kyoto. Sen-no-Rikyū, is considered to be the creator of the Way of Tea concept and first person who set the rules for preparing and drinking tea in the so-called the spirit of attracts, i.e. silence and simplicity. From Rikyū, on the direct line, there are three main families practicing the Way of Tea until today – Urasenke, Omotesenke and Mushanokojisenke, around which the schools of tea are concentrated. 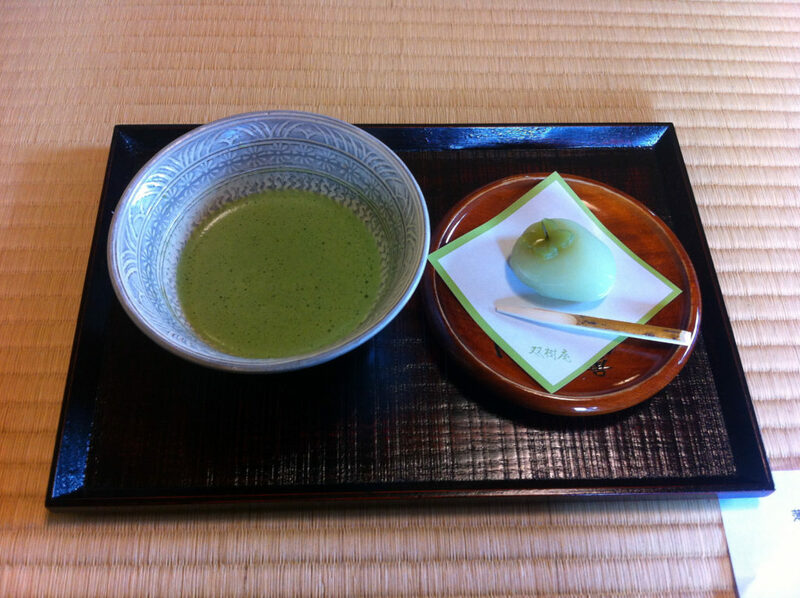 During the traditional tea ceremony matcha (抹茶) tea is served. Matcha is the powdered green tea, which arises as a result of very fine grinding of dried, but unfermented tea leaves. Therefore, what we see in the cups is not a clear infusion on the leaves, but the green, sometimes foamed and quite thick consistency, suspension. I have found the information that in Japan there are also ceremonies where leaf tea is served – eg sencha (煎茶) tea, then it is termed “the way of sencha tea”. Matcha is prepared and served in portions, in special ceramic cups – so-called chawan (茶碗). The tea is stored in containers chaire (茶入) or natsume (棗) and picked up from the container with a special thin bamboo “spoon” called chashaku (茶杓). It is mixed in water with a brush made of one piece of bamboo – so-called chasen (茶筅). Matcha is mixed with hot water – yu (湯), taken from a kettle, which is placed on a portable hearth – so-called furo or hearth permanently built into the floor – so-called ro. A distinction is made between formal tea meetings – so-called chaji (茶事) and already mentioned – informal tea meetings chakai (茶会). In the informal chakai more people who are not familiar with the tea etiquette can take part. 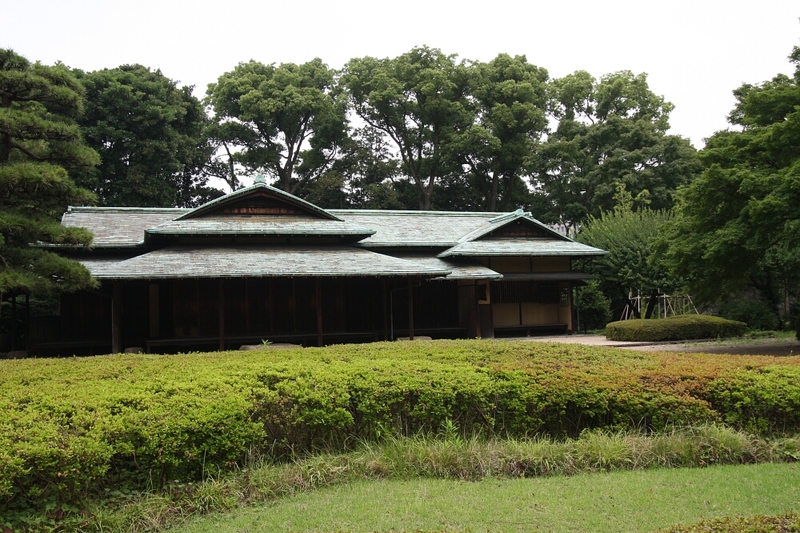 The tea pavilion in which tea meetings take place is called sukiya (数奇屋) or chashitsu (茶室). I hope you enjoyed this article on the Way of Tea and my personal experiences with the tea ceremony in Japan. 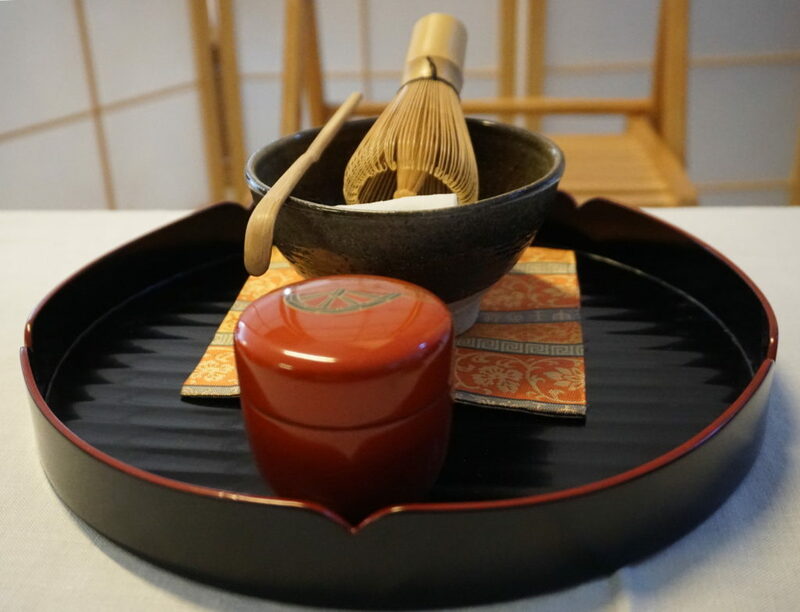 If you want to know more about sadō or you plan to attend the Japanese tea ceremony, it’s worth getting a little ready for it. Personally, I recommend reading one of the books listed below. You liked my post? Give a Like to my Facebook and get the notifications about new posts.